IF YOU'RE LOOKING FOR ADDED GUIDANCE AND INSPIRATION BEYOND OUR INTERVIEWS, SOUL CONTRACT READINGS ARE A HELPFUL TOOL WE OFFER TO CONNECT YOU WITH INSIGHT AND CLARITY SURROUNDING YOUR SOUL PURPOSE/WHAT YOU ARE HERE TO DO IN THIS LIFETIME. READINGS ARE BASED ON AN ANCIENT NUMEROLOGY SYSTEM THAT DECODES THE SOUND VIBRATIONS PRESENT IN YOUR BIRTH NAME. THE IDEA IS THAT EACH ONE OF OUR NAMES CARRIES A SPECIFIC MESSAGE OR "SOUL CONTRACT" TO BE FULFILLED IN THIS LIFETIME. YOU CAN THINK OF YOUR NAME AS THE INNATE SPIRITUAL GUIDE MAP YOU COME EQUIPPED WITH INTO THIS LIFE. 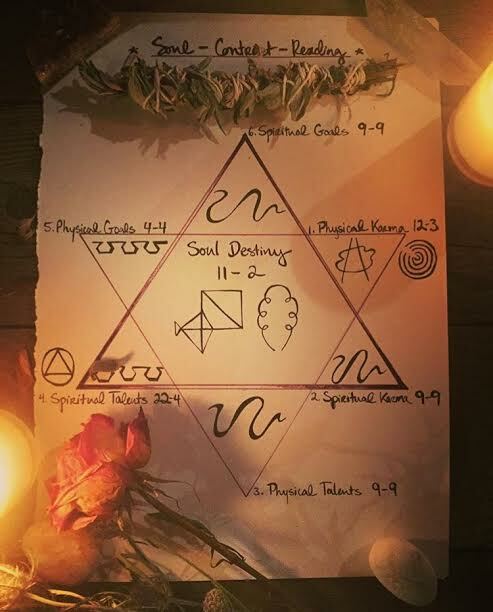 A SOUL CONTRACT READING TAKES YOUR FULL NAME AS IT APPEARS ON YOUR BIRTH CERTIFICATE AND TRANSLATES THE SOUND VIBRATIONS PRESENT INTO A NUMEROLOGY SYSTEM THAT THEN GETS CHARTED ON TWO INTERSECTING TRIANGLES - THE UPWARD REPRESENTING THE SPIRITUAL AND THE DOWNWARD REPRESENTING THE PHYSICAL. YOUR KARMA, TALENTS, AND GOALS ARE MAPPED OUT WITHIN THESE POINTS, CULMINATING IN YOUR SOUL DESTINY/SOUL PURPOSE. SOUL CONTRACT READINGS ARE A GREAT TOOL BECAUSE THEY ARE SOMETHING YOU ONLY NEED TO DO ONCE AND CAN CONTINUALLY RE-REFERENCE FOR INSIGHT. READINGS ARE $150 FOR A ONE-HOUR READING OVER THE PHONE AND COME WITH AN ILLUSTRATED CHART AS SHOWN ABOVE THAT WILL BE MAILED TO YOU ALONG WITH A PRINT OUT OF YOUR READING. PLEASE CONTACT US HERE IF YOU ARE INTERESTED IN A READING AND WE WILL LET YOU KNOW OUR AVAILABILITY FOR THE MONTH.